it is a sin that believes in nothing, cares for nothing, seeks to know nothing, interferes with nothing, enjoys nothing, hates nothing, finds purpose in nothing, lives for nothing, and remains alive because there is nothing for which it will die. One would think “lust” would be the one they hammered on given the religious leanings of the modern church, but it was considered one of the most minor “bad thoughts.” The monks viewed lust as a lower form of greed in that you desired something you didn’t have. Acedia was one of the most severe and deadly thoughts because of the despair and absolute disdain for life it produced in a human being. It’s a shame the word has been lost to ancient textbooks and is no longer used, because acedia’s connotations carry far more weight in today’s cultural environment. The demon of acedia is the one that causes the most serious trouble of all…He makes it seem that the sun barely moves, if at all, and…he instills in the heart of the monk a hatred for the place, a hatred for his very life itself. 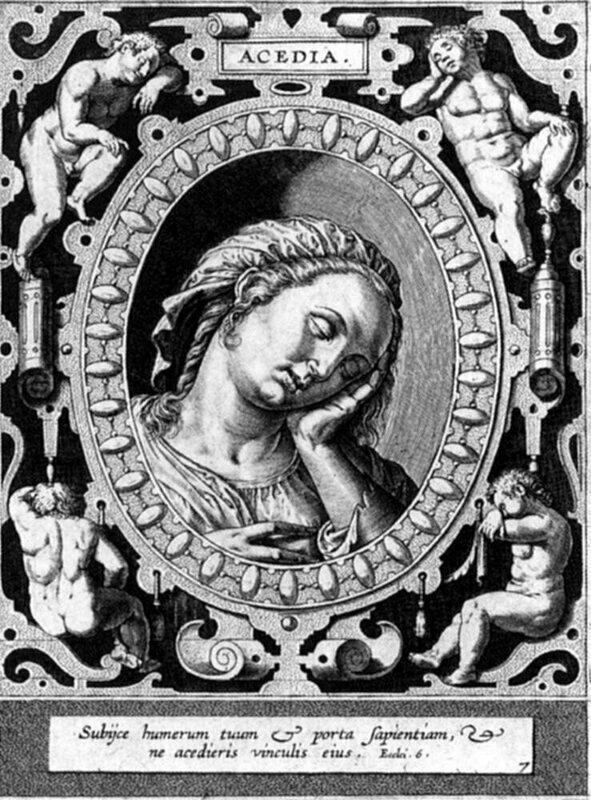 A 16th-century representation of acedia by Hieronymus Wierix. Well, a sloth can masquerade as tolerance. It can also be very busy, but the activity of the slothful leads nowhere, simply marking time in a life that has no ultimate purpose. Many of the slothful end up in despair, a hopelessness that is distinct from clinical depression requiring medical attention. It is, in fact, a state that runs rampant through contemporary culture, in many forms: indifference, workaholism, lethargy, ennui, commitment phobia. People don’t know the word, but they know the condition. She even points to examples of how acedia has atomized within the culture — the ploys of advertising that engender dissatisfaction, our highly structured multitasking lives. We appear to be anything but slothful, yet that is exactly what we are, as we do more and care less, and feel pressured to do still more. Moreover, many scholars equate acedia to depression or ennui, though some religious groups view acedia and depression as separate maladies. The evolution of the sin, from a matter of spiritual inadequacy to the laziness of sloth, reflects the complexity of the history of Christianity, and our conception of what is dangerous to the mind and soul. Combating acedia has simple steps that can help you act and combat the feelings of indifference, self-hate, apathy, and keep you from spiraling further. The bad news is that it begins by choosing to take part in little things that may seem repetitive but make a big difference. You will eventually find joy after completing tasks at work even though sometimes the drudgery seemed insurmountable. By pushing through and praying — even in short bouts — you will be glad you plowed through. Discipline often becomes the defining fire by which things like talent or goals become an actual ability. It is indifference and believing it will always be this way that keeps us stuck. You may be tempted to think, “this is just another way to call depression something else” but consider that there’s always been a power in naming things or knowing your enemy to fight them. Check out more about the deadly sin here. Previous Previous post: What is Consumerism?